A resource for consumers, locksmiths, and security professionals. Door knobs and door handles are a staple part of residential and commercial spaces. Often times, you will find them affixed to interior doors, and if they are used on exterior doors they are used in conjunction with a deadbolt (or another secure locking mechanism) that is used to bolster security. Since door knobs and door handles are so widely used, many property owners have had to deal with a loose door knob or a loose door handle at some point. Dealing with loose door handles and loose door knob problems, in general, can be a hassle, but it’s one of the many responsibilities property owners have to shoulder. Similar responsibilities include learning how to fix a stuck door latch. These kinds of issues cannot be ignored because they will compound, and most door lock problems and broken door locks are much more serious than you think. Today, the focus is primarily on the issues that lead to loose door knobs and loose door handles, and how to effectively correct these issues. In order to dive into this topic we have to first look at the different types of door knobs and door handles that are most commonly used. This will come to bear when we look at the ways in which these door knobs and door handles can be fixed. The different types of door knobs and door handles are often denoted by the positioning of their screws. The types of door knobs and door handles are the exposed mounting screw door knob/handle and the hidden mounting screw door knob/handle. Door knobs and handles that implement exposed screws tend to be found as parts of an older door lock. Issues with this type of loose door knob or loose door handle are relatively easy to resolve because you can see the way all the parts work together within the door mechanism. Hidden mounting screw door knobs and door handles are of a much more modern design and they can be found on newer door hardware. These door knobs and door handles forego the use of an exposed mounting screw and opts to use a mounting faceplate that obscures the screws that are holding the lock firmly in place. It is for this reason that this style of door knob and door handle is slightly more complicated to fix than the one described above. In a general sense, it is quite easy to remedy loose door knobs and loose door handles. Some property owners will be able to tackle this on their own by employing some DIY skills, but I understand that not everyone is comfortable doing this, and that’s ok. If you know you do not have the skills to tackle this then do not overexert yourself. Doing so might result in you damaging your lock. Instead, contact a local locksmith that offers residential locksmith services or commercial locksmith services. They will able to assist you and effectively help you handle your loose door knobs and loose door handles. What causes a loose door knob or loose door handle? Now that you have a basic understanding of the type of door knobs and door handles that are used, we can begin the descent into what you need to know to fix them. Before we arrive at the final destination, we have to understand why some of these problems arise in the first place. This is ideal because it will help property owners avoid loose door knob and loose door handle problems in the future. The screws that are used to connect the components of the door knob and door handle have become loose over time. This often leads to the door mechanics becoming loose and wobbly, which means it will usually not work properly. When it comes to older door knobs and door handles, age and maintenance play an important role. Over time, there are some parts that probably need to be switched out or properly maintained. The main culprits for this problem are the buildup of dirt within the lock mechanism, and also the buildup of dirt. Another simple reason behind loose door knobs and loose door locks is that a screw within the door mechanism has broken off. This means that it impairs the smooth function of the lock. The tools that are required to resolve loose door knobs and loose door handles are very easy to come by, especially if you want to go the DIY route. If not, then you can skip to the next section. Most of these tools can be picked up for cheap at your local Home Depot. Since loose door knobs and loose door handles incorporate so many screws, a standard screwdriver is a must-have tool. Keep in mind that the type of screwdriver you use will be determined by the style of screws that are used in your loose door knob and loose door handle. In order to tighten the screws in a loose door knob or loose door handle, you need to work on removing your loose door knob or loose door handle from the door that it is currently on. However, before you begin to do this, you should take the time to adequately determine which type of door knob you have in place. As a quick recap, the two types of door knobs and door handles are the exposed mounting screw door knob/handle and the hidden mounting screw door knob/handle. 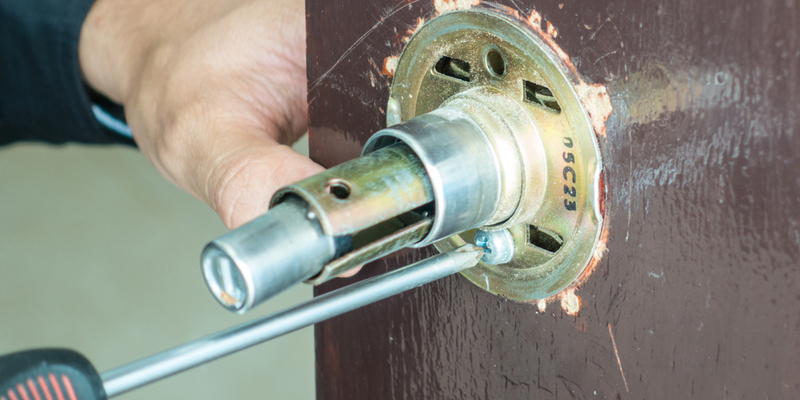 To remove a loose door handle that uses an exposed mounting screw, you need to find the set screw that is holding the door handle securely in place. Once you have located the set screw you will be able to unscrew it and remove the handle that gives you access to the internal mechanics of the lock and the rest of the screws holding it in place. These kinds of door knobs and door handles, come with a faceplate that needs to be removed as well. After you have successfully taken off the loose door knob or loose door handle, you can work on tightening any screws that are loose within the door knob or door handle. For door knobs and door handles that utilize hidden mounting screws, things can be a bit tricky. Tricky doesn’t necessarily mean more difficult. Essentially, you will need to replicate the process discussed above, but hidden mounted screw door knobs do not have any set screws in place. Instead, they make use of a door knob detents. Door knob detents are used to fasten a door knob or door handle to its corresponding spindle without the presence of any visible screws. The door knob detents are spring-loaded mechanisms that have to be depressed for the faceplate to be removed successfully. Once the faceplate is removed, you can gain access to the internal screws. Once you gain access to the internal screws, the process becomes much easier to tackle. If there is a decorative trim or faceplate in place, it has to be removed so you can work on tightening the screws. The solution to this problem is relatively simple. Its simplicity stems from the fact that it is easy to identify the problem, and it is a problem that only affects one type of door knob. Since the set screw is used to connect the door knob or door handle to its adjoining spindle, it only affects exposed mounting screw door knobs and door handles. If you turn your door knob and it doesn’t move the latch, it is often a sign that the cause of your loose door knob or loose door handle is a set screw that is not properly in place. To rectify this problem, you simply have to try and find the set screw. Some door knobs and door handles have the set screw on their interior which makes them easy to find. However, for others, you might have to unscrew the exposed screws in order to gain access to the set screw. In some cases, the issues with your loose door knob or loose door handle could extend beyond some misplaced or loose screws. When this happens, it is usually the case that some important components within the lock are worn out or damaged. These problems could stem from a broken spindle or a door knob trim that is rusted or held up by debris and dirt. The range of problems that could leave you with a loose door knob or loose door handle can only be assessed after you take your door handle apart to gauge the extent of the problem. Most of the other methods that have been discussed had relatively easy solutions that does not require the purchase and installation of new parts. If you are uncomfortable carrying this out, do not hesitate to contact a professional locksmith who offers damaged lock repair services, or who can help you change the locks and door knobs you currently have installed. In some cases, you will not need to buy a whole new door knob set, because you simply have to get a few small parts. Loose door knobs and loose door handles are relatively common problems, but they can be easily remedied. The trick is to make sure that you address the issue early before it escalates into something much worse. As I pointed out, do not hesitate to contact a locksmith to assist you with this problem, especially if you do not think you can tackle it yourself. Get free useful tips and resources delivered directly to your inbox. How Much Does It Cost For Car Key Duplication? Rekeying vs. Replacing Your Locks: What Is The Best Choice For Your Home?